Hart to Modbus gateway (also Hart to Modbus converter) is designed to transfer HART to Modbus for multi-devices by MCU. The hart converter can connect up to 8 pcs of HART devices.The product transfer the most-used part of protocol. Important notice: The product’s development is on the basis of MODBUS to transfer HART protocol instrument. This product will mainly transfer the most-used part of protocol,but can’t ensure can transfer all of HART instruments to MODBUS. 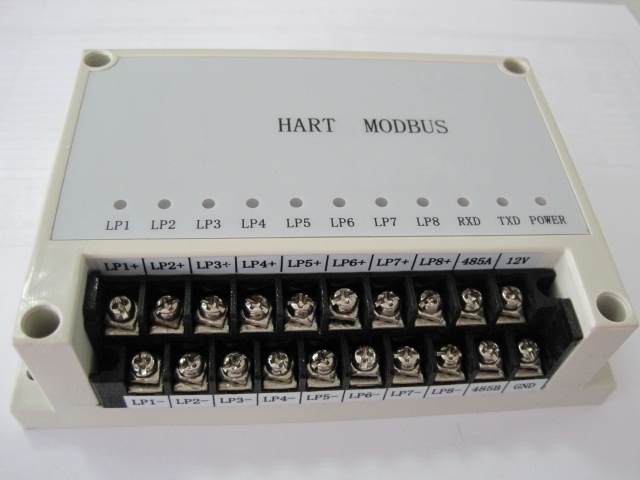 So if you are interested in the hart to modbus gateway, please contact us our technicians with your detailed application so that we can discuss the solution for your requirement. At present, the gateway has work well with pressure transmitter of FUJI,Honeywell’s,etc. 5)Modem with own address,the default is 10H. Instrument address is no sense for applicaiton. 4)Automatically read data, the quickest response time is 0.3S.